There are times when both employees and employers could benefit from concrete evidence of the skills an employee currently has or is required to gain. This job skills checklist is an ideal solution for both parties to keep track of skills. An unemployed individual may want to utilize this job search checklist to keep track of skills attained through school, volunteer work, or other activities in order to effectively update their resume in the future. Someone who is currently employed could benefit from the list by keeping track then presenting it to an employer while asking for a raise or promotion. Finally, a job skills checklist is beneficial for employers to keep an accurate record of their employees’ skills. 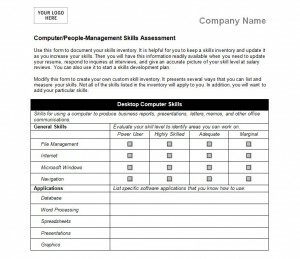 The first step to using this job skills checklist template is to download it right from this site for free then open up Microsoft Word to begin. Next, start to customize the template. It is so easy to add or remove specific skills of interest. You can also select which skills to include levels such as highly skilled or adequate and which to simply check off as completed. There is plenty of space for additional comments, too. Third, when the job skills checklist is completed, print out the list and use it for yourself or distribute it to your employees as needed to fill out the form. This job skills checklist is most effective when it is fully customized to highlight the skills necessary for a particular job title or job field. It is helpful to have employees keep track of their own checklists as a way to hold them accountable for the skills that they have been working on gaining. It may be beneficial to pair up employees to sign off on one another’s lists. Career centers can also benefit from this job skills checklist by handing it out to all of their clients or participants. It is a way to point out strengths and weaknesses.